A double wall prefabricated venting solution for use as a negative, neutral or positive pressure system in many applications including but not limited to Category I Gas, Oil, Dual Fuel, Special Gas Vent, CHP Venting, Generator Exhaust, and Fireplaces. 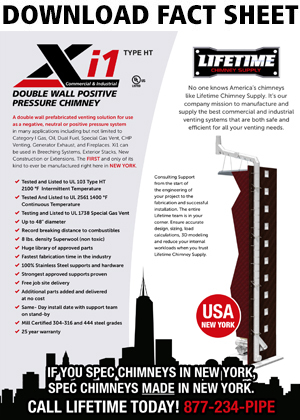 Xi1 can be used in Breeching Systems, Exterior Stacks, New Construction or Extensions. The FIRST and only of its kind to ever be manufactured right here in NEW YORK.